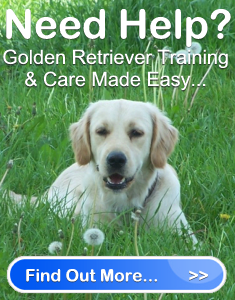 Golden Retriever Training | Golden Retriever Puppy Training | Golden Retriever Savvy " "
Golden Retrievers are recognized as being one of the most loving and loyal of all dog breeds. Golden Retriever training is relatively easy as they are very alert and active, and are extremely playful, sociable and eager to please. They are one of the best companions for families and are happy both indoors and outdoors. Essentially, Goldens are happiest when they are with you. The Golden Retriever is a beautiful breed that has always been a popular favorite among dog lovers everywhere. Their gentle, sweet and easy going temperament has made them a breed that warms the hearts of virtually everyone – even cat people! It is not uncommon for people who own a Golden to stick with the breed, adopting them again and again. Golden Retrievers are a relatively new breed, only dating as far back as the 19th century. They were developed in England and Scotland due to the popularity of the retriever dogs that were already used for hunting purposes. Retrievers were highly desirable because of their medium size, and because they could pursue both upland game and waterfowl. The Golden Retrievers that we have come to know today were developed from the crossbreeding of different dogs including Yellow Retriever, Tweed Water Spaniels, Irish Setters and Bloodhounds. Of all the dogs used, the Yellow Retriever and Tweed Water Spaniels had the most influence on the Golden Retriever, as they were used to obtain the Golden’s yellow color, as well as for some of their more positive characteristics: intelligence, courage and retrieving ability. The development of the Golden Retriever is credited to Lord Tweedmouth at Inverness-Shire, Scotland. Golden Retrievers became very popular in England at the end of the 1800’s, and when first shown in England, were called “Golden Flat-Coats”. It wasn’t until 1913 when the Golden Retriever Club of England was formed that Golden Retrievers achieved their individual status. In 1920, the breed finally made its way to North America, and was registered with the American Kennel Club in 1925. Golden Retrievers were practically an instant success from the time they were developed, and have yet to lose their popularity with dog owners. They are one of the most beloved and cherished dog breeds in the world. Golden Retrievers are an outstanding breed of dog. They are completely deserving of their popularity as their devotion and obedience are amiable traits that can’t be compared. Goldens are apart of the Sporting dog group which means by nature they are hard working, active and loyal. They are champion show and sport dogs. They have a strong build, weighing between 65-70 pounds, and a medium height averaging 24 inches at the shoulders. Throughout history their incredible sense of smell, intelligence, and natural retrieving instincts have made them ideal hunters, police dogs and seeing-eye dogs for the blind. Golden’s are easy to groom and only need to be brushed bi-weekly. Keep in mind they do shed, especially during their two major shedding seasons. Therefore, twice a year, expect to find large tufts of fur kicking around your home if you have a Golden. Golden Retrievers are gentle and laid-back, which makes them excellent with children, and other family pets of all species and sizes including cats, fellow Goldens, and mini rodents. However, due to their friendly and carefree personality, Golden’s do not make good guard dogs. Goldens love to swim and play outdoors, and will want to be with you everywhere you go. They crave attention and need plenty of it. They also need plenty of training so they can grow up as a credit to their breed. In addition, Goldens – especially younger dogs – have high energy and can be destructive if not provided with the necessary exercise or training. Moreover, Goldens are incredibly playful and mischievous, and won’t think twice about trying to outsmart you if you don’t show them who is boss. Although Golden’s can adapt well to both country and city life, Golden Retrievers require a good amount of exercise, and should be walked at least twice a day for at least 20 minutes each time. Golden Retrievers make a wonderful family pet, and are a fine choice for the first time dog owner. If you are interested in obtaining this breed, you need to do thorough research to ensure that you can meet their needs and commit to them for the duration of their life span which is usually between 12 – 14 years. When all is said and done, Golden Retrievers are the best friends you could ever ask for.